Scrapbooking Paper - SHERLOCK HOLMES (12x12) Very unique papers!!! This paper pad contains 8 double sided printed sheets from collection (2x8 designs + 1 bonus on the top sheet).Thickness:190 g/m. Acid & lignin free. Scrapbooking Paper - SEA ADVENTURE (12x12) Very unique papers!!! This paper pad contains 8 double sided printed sheets from collection (2x8 designs + 1 bonus on the top sheet).Thickness:190 g/m. Acid & lignin free. Scrapbooking Paper- NEEDLEWOMAN (12x12) Very unique papers!!! This paper pad contains 8 double sided printed sheets from collection (2x8 designs + 1 bonus on the top sheet).Thickness:190 g/m. Acid & lignin free. Scrapbooking Paper- MY GARDENING (12x12) Very unique papers!!! This paper pad contains 8 double sided printed sheets from collection (2x8 designs + 1 bonus on the top sheet).Thickness:190 g/m. Acid & lignin free.In every collection from Bee Shabby 2 sheets are with elements for self cutting. Scrapbooking Paper- BOY STORY (12x12) Very unique papers!!! This paper pad contains 8 double sided printed sheets from collection (2x8 designs + 1 bonus on the top sheet).Thickness:190 g/m. Acid & lignin free.In every collection from Bee Shabby 2 sheets are with elements for self cutting. 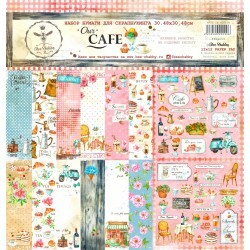 Scrapbooking Paper- OUR CAFE (12x12) Very unique papers!!! This paper pad contains 8 double sided printed sheets from collection (2x8 designs + 1 bonus on the top sheet).Thickness:190 g/m. Acid & lignin free. Scrapbooking Paper- HELLO WINTER (12x12) Very unique papers!!! This paper pad contains 8 double sided printed sheets from collection (2x8 designs + 1 bonus on the top sheet).Thickness:190 g/m. Acid & lignin free. Scrapbooking Paper- THE NUTCRACKER (12x12) Very unique papers!!! This paper pad contains 8 double sided printed sheets from collection (2x8 designs + 1 bonus on the top sheet).Thickness:190 g/m. Acid & lignin free.